CHICAGO (AP) Addison Russell's future with the Chicago Cubs is a tentative proposition. 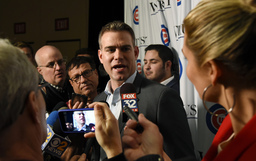 President of baseball operations Theo Epstein says Russell is getting a "conditional second chance" with the Cubs after he was suspended for 40 games last October for violating Major League Baseball's domestic violence policy. Even the slightest misstep likely would mean the end of his time with the team. "We are going to take it one day at a time," Epstein said Friday on the first day of the Cubs' annual fan convention. "If he continues to meet the high standards we've laid out for him, put the work in, he will be eligible to return to the Cubs after serving his full suspension." Russell, who turns 25 on Wednesday, isn't allowed to attend this weekend's festivities because of his punishment, but he is expected to be with the team for spring training. The troubled shortstop is eligible to return on May 3 against St. Louis, barring any postponements. Russell was disciplined after his ex-wife Melisa Reidy published a blog post in September describing years of physical and emotional abuse. In November, on the same day the Cubs announced they had offered him a contract for 2019, Russell apologized to Reidy and his family for "my past behavior." Epstein said the team's first inclination after Russell was suspended was "just to move on." "The more we considered all perspectives and all factors, the more we dug in, once we were able to do our own research and investigation after MLB issued its discipline we started to consider some other arguments as well," Epstein said. "First of all, that this happened on our watch. That Addison's been in our organization since he was 20 years old. That we were certainly quick to celebrate his triumphs, and that separating ourselves from him as quickly as possible at his lowest point was maybe not a comprehensive solution to the issue." Russell was once considered one of the top young shortstops in baseball. He was selected by Oakland in the first round of the 2012 draft and traded to Chicago in the July 2014 deal that moved pitchers Jeff Samardzija and Jason Hammel to the Athletics. Russell helped the Cubs win the World Series three years ago, batting .238 with 21 homers and 95 RBIs in 151 games. Epstein said the team talked to several domestic violence experts and Reidy before deciding what it wanted to do. "I was engaged with Melisa Russell, the victim, who deserves our support every bit as much if not more than Addison given the circumstances," Epstein said, "and she was supportive of our decision as long as it was truly a conditional second chance. She felt like this was Addison's best chance to get his life in order." The Cubs also are hoping to learn from what happened. "I think we saw it as an opportunity to try to improve the organization when it comes to domestic violence," Epstein said. "This happened here. "We can do everything we can to try to make this the safest possible workplace, the healthiest possible workplace, so that it has as little chance as possible of ever happening again here."